A caterpillar decorated my Color Guard yucca! 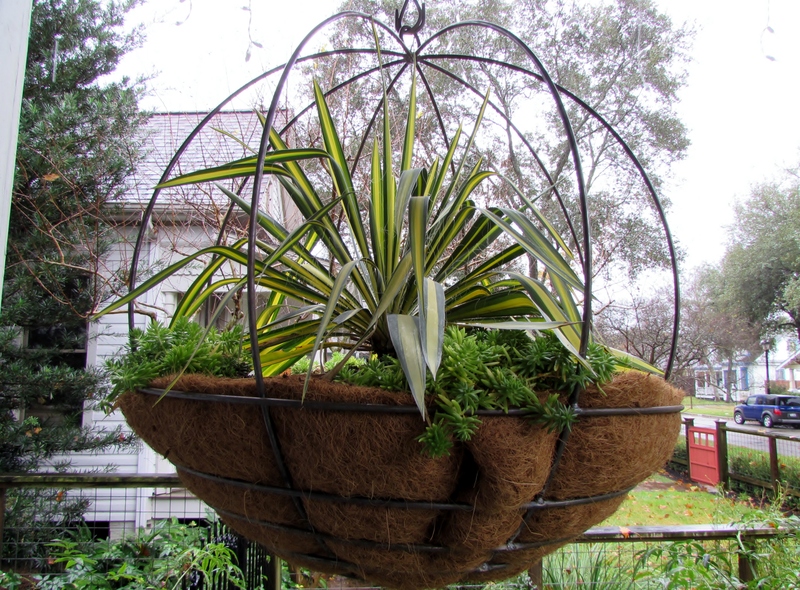 I am not sure where I first saw these metal hanging baskets but it was instant lust. They come in several sizes from the online shop Terrain. I started with a small, medium and large one. When I went back to order one more I accidentally ordered this giant one. I was considering it but worried it might be too big. Guess I left it in my cart. I know, I could have returned it but that thought didn’t last long. Then what to plant in it? I already knew I wanted to hang it at the other end of the porch where there is good light. Looking out at our orphaned plants and talking to Shawn we decided to try one of the Color Guard yucca. It will surely have good drainage hanging. I found some left over Mexican sedum and planted them around the edge. I am hoping they fill in and spill over the edge. 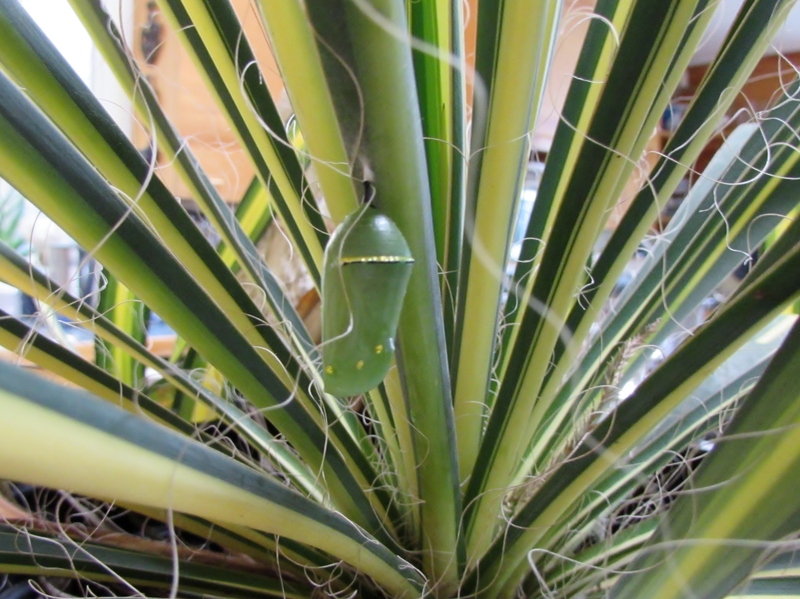 When I brought the yucca into the kitchen to clean it up I noticed this chrysalis. I posted a picture on Facebook because I wasn’t sure what it was. Yes, it is a Monarch chrysalis. I didn’t expect that on a yucca! But we did have many Monarchs visit Ravenscourt this year. What a safe place to hang. 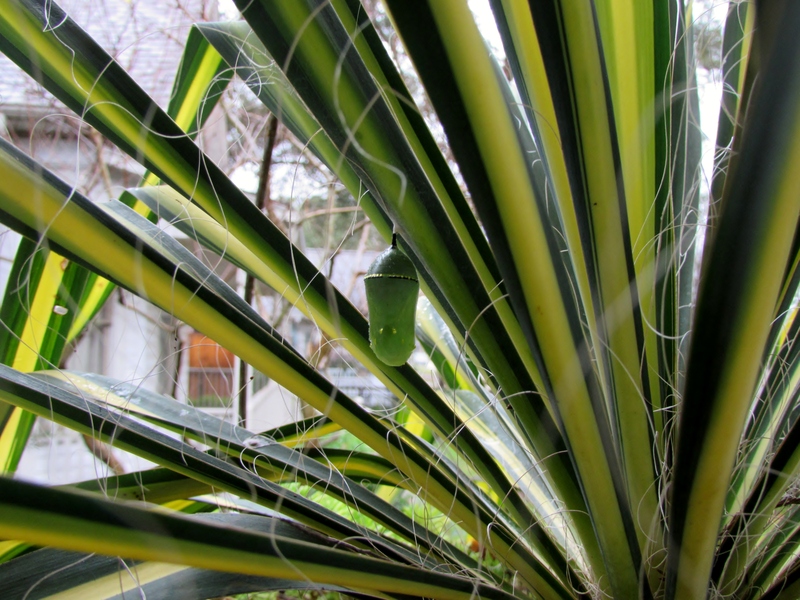 I have trouble imagining the caterpillar climbing up the yucca leaf. I don’t think he did much eating along the way. I found some great information on the Monarch Watch website. Since I have spent the last couple of weeks putting up Christmas decorations I could not help but think of this small chrysalis in green with gold trim as an ornament. 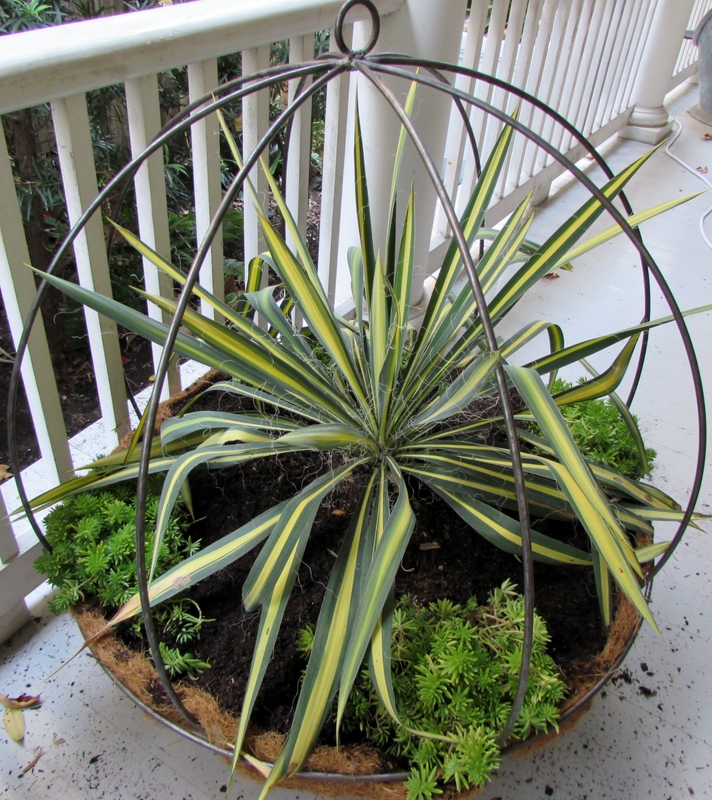 I was very careful planting the yucca hoping it would stay intacted. Getting the plant between the bars is a little tricky. 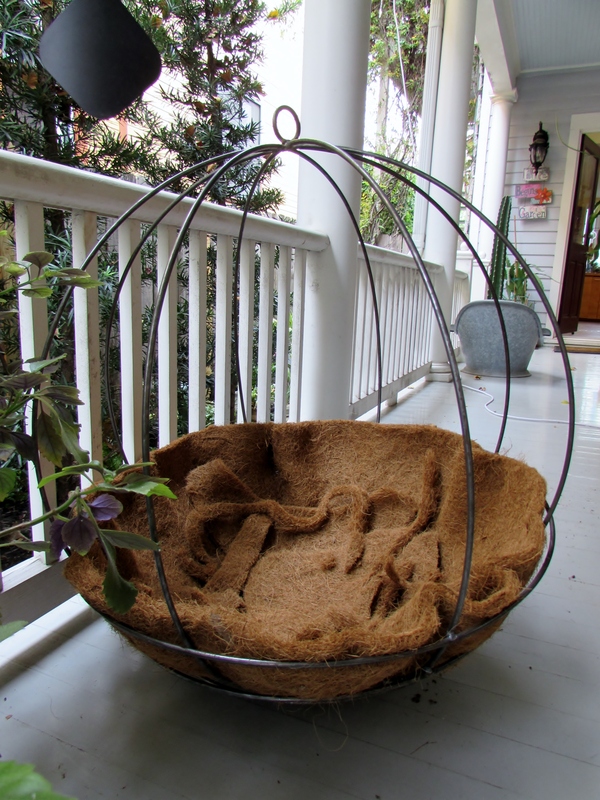 First I had to buy coir liner and cut it to fit the basket. Our local nursery Buchanan’s Native Plants sells it by the foot. I took the extra bits and put them in the bottom of the basket hoping that it would be lighter than soil. When it was all done we put up two eye hooks and hung the basket. Thankfully the pretty ornament is still there. Now that I know it exists I will be checking on it often! This yucca, also called Adam’s Needle, because of the long, curly threads or filaments that appear on the leaves. The name started as Adam’s Needle-and-Thread which refers to the pointy tip at the end of each leaf and the threads that decorate these edges. Eventually it was shortened to just Adam’s Needle. I have only heard it called Color Guard. It needs full to part sun, good drainage and once established minimal water. Yuccas are native to hot, dry places like deserts, sand dunes, and plains. The original species, Yucca filamentosa, is native to southeastern North America – from North Carolina to Florida, and west to Tennessee and Mississippi. It is quite adaptable and hardy in zones 4-10. It has strong architecture with sword-shaped arching leaves. Full grown the rosette can be 3-4 feet in diameter and 3 foot tall. The foliage is covered in curly white hairs a a wonderful creamy center that fades and can take on rose overtones as the weather cools. Dan Hinkley, founder of Heronswood rated this one of his 10 most indispensable plants. When it flowers the stalks can reach 6 feet tall. That might be a problem for me. It is said to do well in containers and looks great in mass plantings. Next I plan to see if we can string lights on the outside of the metal basket! If not this year next year for sure! Great post. Yes, some of the the Monarch’s chrysalis are built on nearby plants from the host one. The cremaster is extremely sturdy. I covered a Monarch metamorphosis photographically, and was marveled. Our Milkweeds here are giants, “Calotropis procera”, they grow as large shrubs and with pruning convert to small trees. The good of drainage for Yucca cannot be overemphasized. The are extremely prone to ‘sooty mold’. I tried to save a huge infested Yucca plant (pot-contained), but our land crabs ended up eating the roots also, so the sooty mold may have not been the cause of its death. Nevertheless, the little offshoots were all saved and immediately rooted again. Merry X-mas, and I love your blog!! What a cool idea! I always have more yucca pups than I know what to do with. Keep us informed as to who emerges! Thank you for the link Tina. Great information. Merry Christmas!